The Porter-Sesnon family name is well known to many faculty, staff, and students at UC Santa Cruz. The fifth college founded at the campus was renamed Porter College in 1981, and a gift of nearly 70 acres of Porter-Sesnon land created an endowment for the college that has provided countless scholarships, grants, and funding for Porter undergraduates and programs. In 1968, a gift from Barbara Sesnon Cartan also established the Mary Porter Sesnon Art Gallery at UC Santa Cruz, in memory of her mother. 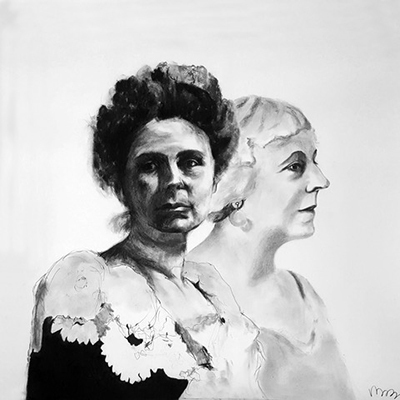 And now in 2018, the gallery will present a special exhibition celebrating the life of Mary Porter Sesnon (1868-1930) and her influence on the arts in Santa Cruz County. Titled “Mary Porter Sesnon and Pino Alto,” it opens on April 12, with a public reception at the gallery beginning at 5 p.m.
Mary Porter spent her childhood in Soquel, CA, before moving to Los Angeles and San Francisco, and traveling to Europe with her family. 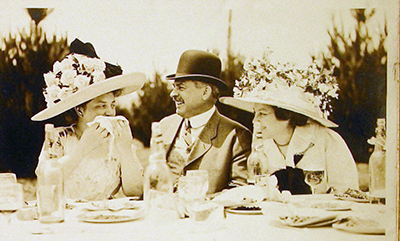 She married William T. Sesnon in 1896 and together they returned to her childhood property, where they built a summer home called Pino Alto and hosted cultural salons from 1911 to 1927. (Pino Alto was named after a tall pine tree near the driveway; it is now called the Sesnon House and serves as headquarters for the culinary arts program and restaurant for Cabrillo College in Aptos). The UC Santa Cruz exhibition will feature sketches and watercolors from a remarkable scrapbook made during those historic Santa Cruz salons, including calligraphy by Mary Porter Sesnon, along with paintings by California artists such as Will Sparks, a painter known for his depictions of California missions; Ferdinand Burgdorff, celebrated for his works on coastal views; Haig Patigian, a renowned neoclassical sculptor; and landscape artist Cor de Gavere, a member of the “Santa Cruz 3,” along with fellow artists Leonora N. Penniman and Margaret E. Rogers. “The exhibition places Ms. Sesnon at the center of it all--organizing creative salon-type parties that helped break down social and intellectual barriers and brought a variety of people together in new ways,” said curator Shelby Graham, director of the Sesnon Gallery. Graham noted that the Sesnon Gallery continues to host salons today as contemporary academic gatherings for lively discussions and performances. The work of Sesnon’s great-granddaughter, UC Santa Cruz alumna Molly Porter Cliff Hilts, and other Sesnon family members can also be found in the show. In fact, Hilts’ recent paintings and larger-than-life drawings will be featured in the adjacent Porter Faculty Gallery during the exhibition. Hilts graduated from UC Santa Cruz in 1981, with a B.A. in Fine Art from Porter College. 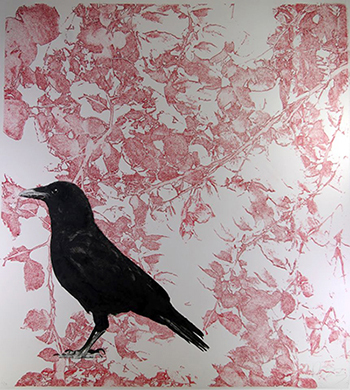 Her art is part of an emerging form that melds painting, photography and printing, using wax, lithographic ink, oil and graphite. “I made friends for life at UCSC and stayed in Santa Cruz after college, for a few years, working for a couple of local architecture and design firms,” she added. Hilts’ artwork can now be found in notable collections worldwide, including the private collection of Bill and Melinda Gates. “Mary Porter Sesnon and Pino Alto” opens at UC Santa Cruz on April 12, with a free public reception at the Mary Porter Sesnon Art Gallery, beginning at 5 p.m. The exhibition runs until May 12. Admission is free. 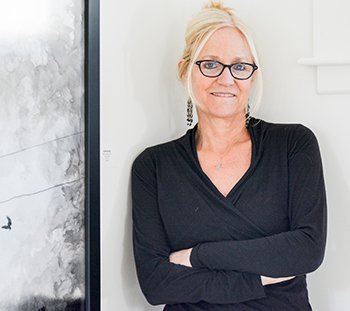 Concurrently showing in the Sesnon Underground Gallery will be “For the breath of a poem,” an installation by alumna Diane Jacobs (Porter ‘88). For more information, contact sesnon@ucsc.edu or 831-459-3606.